It is now a century since the gracious Mother of God, the ever-Blessed Virgin Mary appeared to three young shepherds Lucia, Jacinta and Francisco in the obscure village of Fatima, Portugal in 1917. 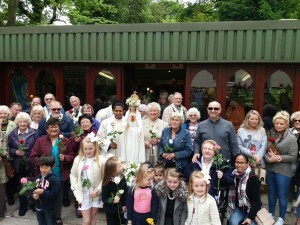 Ladyewell Shrine was not left out in this great celebration that also witnessed the canonization of two of the little shepherd-seers: Jacinta and Francisco Marto (Saints). The shrine was filled with the spirit of communion – an embrace of Heaven and Earth – as many who came from parishes nearby, covering Lancaster and Salford Dioceses and Liverpool Archdiocese to participate in the prayerful events of today bore witness. Thanks to Fr. O’Shea who also joined in making the celebration a graceful one. Providentially, in the light of Ecumenism, the Bishop of Middleton, Rev. 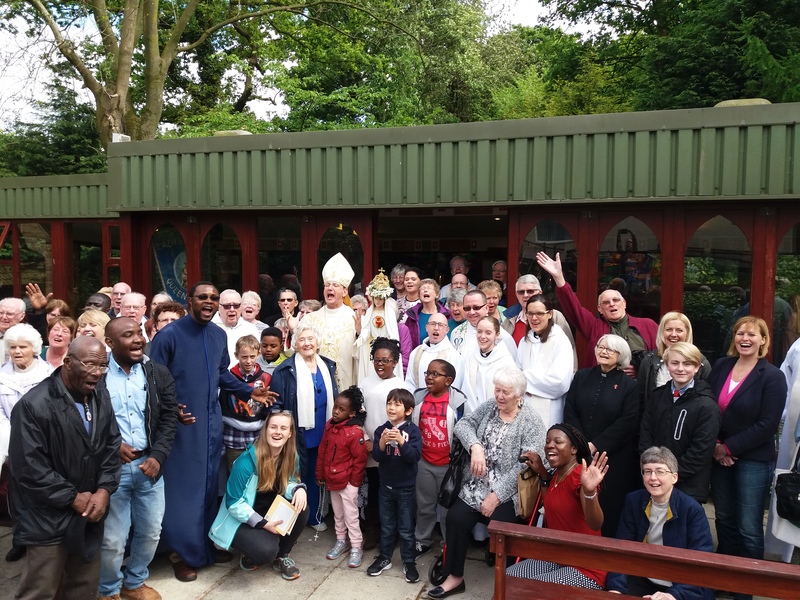 Mark Davies led some of his faithful and ministers of the Anglican communion to the Shrine to celebrate their 10 years anniversary of pilgrimage to Ladyewell Shrine. 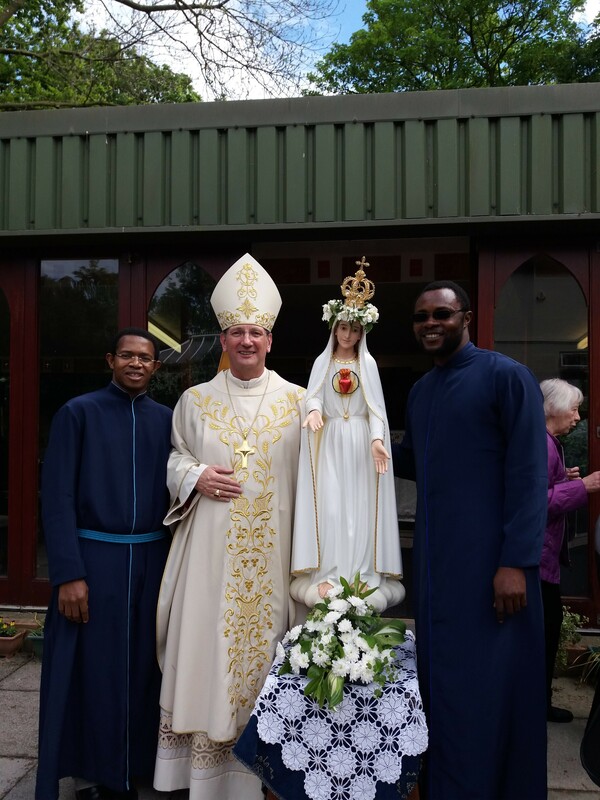 May the Virgin, Our Lady of Fatima and Saints Jacinta and Francisco intercede for us always for peace in our hearts, peace in our homes and peace in our world. OUR LADY OF FATIMA : THE SIGN OF PEACE BETWEEN CHRISTIANITY AND ISLAM. Our Blessed Virgin Mary appeared six times in 1917 to three simple children namely Jecinta Marto, age 7; Francisco Marto, age 9 and Lucy Dos Santos, age 10. The apparition took place in a small village of Portugal called Fatima. The name of the Village alone has an interesting history. Centuries before the apparitions, from April, 711 to 1492 AD, Muslims conquered and occupied the lands of Spain and Portugal, forcing the people to become Islam. During this time of Moorish occupation, the small village in Portugal was named after a beloved 12th century Muslim princess named Fatima. Due to a reconquering by the defending Christian forces , Islamic princess Fatima was captured. Princess Fatima married the Spanish Count of Ourem and converted to Catholicism. At baptism, she changed her name to Oureana. Her Original name was Fatima because, in the Islamic faith , many girls are named after the daughter of Muhammed(Fatima ), the founder of Islam who lived from 570 to 632 A.D. It is not a mere coincidence that Our Lady has chosen to bring the world the message of hope and peace as well as warning of upcoming trial and tribulation in this obscure village in Portugal named after the daughter of Muhammed, a highly revered lady in Islamic religion. It is providential. Islam is an Arabic word which means “to make peace.” Islam is a religion founded by Muhammed, which considers the Koran as it’s holy book. Adherents of Islam believe with Christians and Jews in One true God. History has recorded numerous conflicts between Christians and Muslims. Studies in comparative religion reveal that it is extremely difficult for Christian missionaries to convert Muslims . This is because they see their religion as accomplishment of Christianity. They understand Jesus to be a prophet and not God while for them Muhammed is the final prophet of God. The Muslims believe that they have the definitive revelation of God to the world and that Christ was only a prophet announcing Muhammed . However this might seem to be, there is a special relationship between Muslims and Blessed Virgin Mary. “When the Muslims invaded the Holy Land in the 7th century, they destroyed every Christian Church , with one remarkable exception: The Basilica of St Anne in Jerusalem, because it was believed to be built over the spot where the Blessed Virgin Mary was born. Their great reverence to Our Lady precluded the Muslims from destroying Her birth place. It is recorded that a statue of Our Lady holding her Divine son Jesus was given to Saint Leander, Archbishop of Seville, by Pope Gregory the great. According to local legend , when Seville and most part of Spain were taken by the Muslims in the year 712 A.D, a group of priests fled northward and buried the venerated statue in the hills near the Guadalupe River(wolf river) in Extremadura. At the beginning of the 14th century, the Virgin appeared one day to a humble cowboy named Gil Cordero who was searching for a missing animal in the mountains. Cordero claimed that the Virgin Mary had appeared to him and ordered him to ask priests to dig at the site of the apparition . Excavating priests rediscovered the hidden statue and built a small shrine around it . This shrine is located nearby Francisacan monastery next to the “Wolf River.” The Muslims during their Spanish occupation had actually named the River . The Islamic name for Wolf River is “Guadalupe.”(Guada means River, Lupe means Wolf). Hence , the famous Catholic image in Spain has been known since the 14th century by the Islamic name of Our Lady of Guadalupe. Our Lady appeared in 1531 to a native Mexican peasant named Juan Diego. When asked her name by Juan Diego at the request of the Local Bishop , Our Lady’s response, in the Aztec language (as Juan is of Aztec Indians ) was ” te coatlaxopeuh”( pronounced: ” te quatlasupe “) and meant ” one who crushes the head of the stone serpent.” To Juan Diego and his fellow Aztecs, this revelation had great meaning , coupled with the miraculous image of Our Lady standing on top of a “crescent”, the symbol of evil serpent god worshipped by the Aztec Indians with human sacrifice. A tremendous wave of conversion to Catholicism ensued. However, Bishop Zumarrage who was from Spain, made what some people term a ” heavenly mistake ” that one day may lead to the conversion of Muslims. To the Bishop’s Spanish ears Our Lady’s Aztec name of ” Te Quatlasupe ” sounded just like the name of the revered Madonna from Spain with the Islamic name “Guadalupe.” So the Bishop referred to the Lady that appeared to Juan ad Our Lady of Guadalupe. That is how we have in Mexico the Shrine of Our Lady of Guadalupe. It is interesting that the “crescent” is also a symbol for Islam. Fatimah bint Muhammed, is a woman highly revered in Islam . She was given the title , Al – Zahra, ” shinning one”, and Muhammed once said about her , ” Thou shalt be the most blessed of all the women in paradise , after Mary.” Fulton Sheen in his work , ‘ The World’s First Love’ opines , ” This brings us to the second point, namely, why the Blessed Mother, in this twentieth century, should have revealed herself in the insignificant little village of Fatima, so that to all future generations she would be known as ” Our Lady of Fatima. 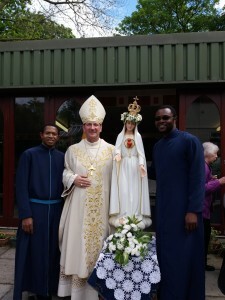 ” Since nothing ever happens out of heaven except with a finesse of all details, I believe that the Blessed Virgin chose to be known as ” Our Lady of Fatima ” as a pledge and a sign of hope to the Muslims and an assurance that they, who show her so much respect, will one day accept her Divine Son, too”. Evidence to support these views is found in the historical fact that the very place Our Lady appeared in 1917 bears a historical connection to Fatima, the daughter of Muhammed. At Fatima , Our Lady thought us to pray the rosary everyday. She called herself the Lady of the Rosary. 7th of October 1571 is historical as a day when Islamic force was overthrown in Europe through the intercession of Our Lady when Pope Pius V charged all Christians to pray the Rosary for Victory over extremist Muslims. At Fatima our Lady promised that there will be conversion of sinners and conversion of Russia. As we can understand, her sheer apparition in Fatima is a promise of the conversion of Islam but he beckoned us to pray our Rosary. First of all , let me point out that the Church has always shown no hatred to Muslims and adherents of other religions as hatred for a human being is not in the teaching of Christ. In LG16, the Fathers write ” But the plan of Salvation also includes those who acknowledge the creator, in the first place among whom are Muslims..With us they adore the One , merciful God.” It is good to know also that it is unchristian as it is uncharitable to hate a Muslim . It is not all Muslims that are violent or pugnacious. We cannot because of a few extremists among them regard all Islamic adherents as violent. The Church has always called for Love and peaceful dialogue. Fr Miguel Angel Ayuso, Secretary of the Pontifical Council for Interreligious Dialogue, in 2014 , said ” the Catholic Church recognises that Muslims honour the Virgin mother of Jesus, Mary , and invoke her with piety ….Mary is mentioned various times in Koran . Respect for her is so evident that when she is mentioned in Islam, it is usual to add ‘ Alayha l-salam ‘(peace be upon her). Mary , a model for Islam and Christians is also a model of dialogue. ” Fulton Sheen is of the view that ” Missionaries in the future will, more and more , see that their apostolate among the Muslims will be successful in the measure that they preach Our Lady of Fatima. Mary is the advent of Christ , bringing Christ to the people before Christ Himself is born. In any apologetic endeavour, it is always best to start with that which people already accept”. In this world charged by religious conflicts and agitation, a clarion call is made by our Lady in Fatima to pray her ROSARY fervently for the Peace of the world. She promised that at the end her Immaculate Heart will triumph . What is expected of us Christians is to pray for our Muslim brothers and sisters, to love them and go into dialogue with them. Like Fulton Sheen ,” we believe that the Blessed Virgin appeared at Fatima in order to be known as ” Our Lady of Fatima “. A pledge and a sign of hope to Muslim people , and an assurance that they , who show her so much respect, may one day accept her Divine son, too.